When high-performance equipment such as a CNC spindle underperforms or fails, the owner of that machine can have a million dollars worth of equipment that is essentially out of business or producing substandard products. Clearly, it is critical to get the spindle repaired or replaced in order to get it back up and running – posthaste. But that is often not as simple as it might seem. There are several components and systems related to spindles that could very well be the cause of spindle failures or contribute to them. Many of these causes can go undetected and instigate recurring failures, resulting in weeks of downtime and costly consequential damage to related equipment – unless the root cause of failure is precisely determined and reported by the spindle repair shop. “What is really needed after a spindle is damaged, and especially after a catastrophic failure, is a detailed failure analysis report, including the data accumulated thorough comprehensive inspection and testing,” says David Kirkpatrick, president of Superior Spindle Service (Taylor, MI), a company that specializes in repairing and remanufacturing machine tool spindles. “Unfortunately, not every repair shop can provide that,” he adds. Kirkpatrick says that a comprehensive failure analysis report should clearly show when the real cause of failure is not the spindle itself, but something related to the motor, bearings, gages or even improper spindle mounting. Generally speaking, failure analysis amounts to the process of collecting and analyzing data to help determine the true cause(s) of a failure. The goal of this is, of course, to recommend corrective actions that will help avoid future failures. Kirkpatrick says these problems were all solvable, but it was necessary to work with the machine shop customers to identify each issue and correct each one of them. The critical phase of an in-depth failure analysis process is the report that documents findings and includes recommendations for corrective actions. Kirkpatrick recommends an intensive program that encompasses not only attention to the spindle, but also motors, bearings, air purge and other associated components. His company treats failure analysis as a primary service function. In some cases, particularly when it appears that customers might be perplexed by failure analysis reports that indicate complex root causes of failures, it is advisable for the spindle repair shop to provide another level of validation, via the component manufacturer or supplier. When customers experience repeated failures, Kirkpatrick advises that spindle services visit the customer’s production line to get a firsthand view of the CNC center on which the spindle is running. When technicians perform on-site inspection, problems not pertaining specifically to the spindle itself may be discovered. For example, one of Superior Spindle Service’s major automotive customers was experiencing repeated failures which had caused considerable downtime as well as over $120,000 in spindle service costs. Other on-site visits have revealed setup and alignment problems, improper spindle mounting, and motor-related problems, and controller malfunctions. Kirkpatrick is convinced that intensive failure analysis can lead to extended spindle service life. For example, when customers are working with softer metals decreasing Spindle RPM and Increasing Feed Rates can increase Spindle Life with no impact on Cycle Times. In another instance, one of his customers was chronically burning bearings due to running a spindle continuously at high speed. So, the spindle technician recommended a different bearing setup, and the spindle service life improved dramatically. Superior Spindle Service feels so strongly that spindle life can often be improved through proper failure analysis that the company has an inspection center that is dedicated to spindle motor electronics. This includes motor mega-ohm value, thermistor value, encoders, motor proximity sensors, and analog sensors. Kirkpatrick believes that, when a spindle is underperforming in a specific application, it is possible to improve on performance through spindle design modifications such as spindle metallurgy or shape. 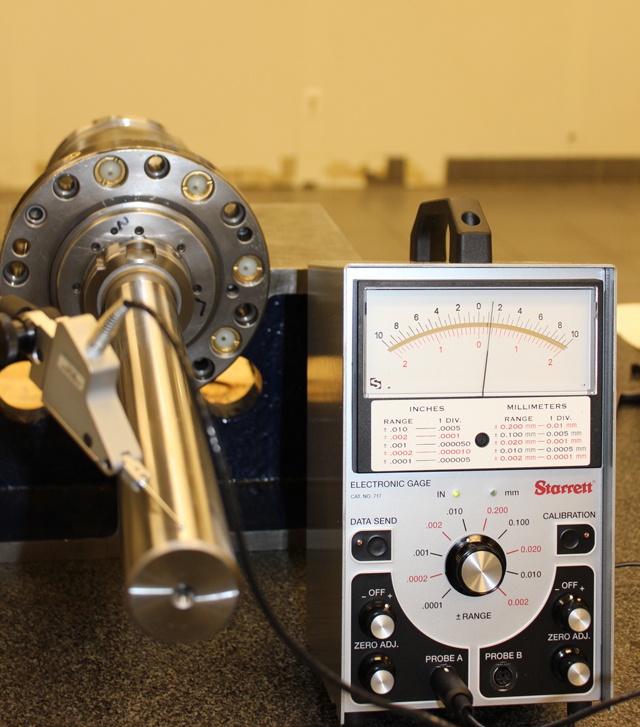 For example, through the use of air gaging equipment, Superior Spindle Service is capable of detecting when a customer’s spindle taper is out of OEM spec, and can help return the taper to the proper spec within 50 millionths of an inch. However, if a somewhat modified taper will improve performance for the customer’s specific application, the air gage equipment can precisely verify the geometry of that modification as well.